Hi, and thanks for visiting my site. 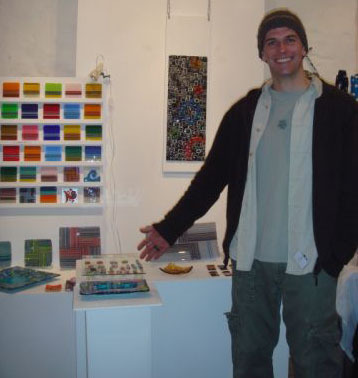 My name is David Pascoe, and I make kilnformed glass from my studio in Hayle, Cornwall. I have been working as a glass artist since 2002, and started my own studio in 2003. Before this I was a fisherman, working out of Hayle harbour catching crab and lobsters. Going back even further, I have had a variety of jobs, including outdoor pursuits instructor, surfboard repairer, and barman, to name a few! Many of these jobs were seasonal, which allowed me to get away in the winter and travel in search of warm water and good surf. Surfing has been an addiction for many years, although I don't like the cold water here in the winter much anymore! I first discovered kilnformed glass through a friend who had worked at a glass factory in Australia, and I later saw kilnformed glass in Australia myself. Most of the glass I saw was formed float(window) glass, but it was inspiring.